Located on Deck 6, and approximately 246 sq. ft. (23 sq. m) in size, these cabins have one double or two single beds, and a 55 sq. ft. (5 sq. m) walk-out balcony. A separate combo sitting area/bedroom with a sofa bed and additional closet, refrigerator, TV, state of the art “infotainment” system, and private bathroom with shower is also featured in each cabin. Located on Decks 5 and 6, and approximately 215 sq. ft. (20 sq. m) in size, these cabins have one double or two single beds, and a 55 sq. ft. (5 sq. m) walk-out balcony. A sitting area with sofa, refrigerator, TV, state of the art “infotainment” system, and private bathroom with shower is also featured in each cabin. Located on Decks 5 and 6, and approximately 270 sq. ft. (25 sq. m) in size, these cabins have one double or two single beds, and a floor-to-ceiling glass Juliet balcony. A sitting area with sofa, refrigerator, TV, state of the art “infotainment” system, and private bathroom with shower is also featured in each cabin. Located on Decks 5 and 6, and approximately 278 sq. ft. (26 sq. m) in size, these cabins have one double or two single beds, and a 110 sq. ft. (10 sq. m) walk-out balcony with access from sitting room and bedroom. A separate sitting area with sofa, walk-in closet, refrigerator, TV, state of the art “infotainment” system, and private bathroom with shower is also featured in each cabin. Located on Deck 5, and approximately 334 sq. ft. (31 sq. m) in size, these cabins have one double or two single beds, and a 110 sq. ft. (10 sq. m) walk-out balcony with access from sitting room and bedroom. A separate sitting area with sofa, his & hers closets, refrigerator, TV, state of the art “infotainment” system, and private bathroom with shower and his & hers sinks is also featured in each cabin. Located on Decks 5 and 6, and approximately 355 sq. ft. (33 sq. m) in size, these cabins have one double or two single beds, and a 110 sq. ft. (10 sq. m) walk-out balcony with access from sitting room and bedroom. A separate sitting area with sofa, refrigerator, TV, state of the art “infotainment” system, and private bathroom with shower, his & hers sinks, and bathtub is also featured in each cabin. With a population of more than 63,000 people, Ushuaia is the southernmost city in the world. The city has grown over the past few years, yet it has retained an easy going and accessible feel. With the sea to the south and mountains to the north, Ushuaia is a spectacular departure point for your Antarctic cruise. If you arrive early, you can spend some time in the nearby Tierra del Fuego National Park, enjoy some Argentinean wines and barbeques in the city, or visit the many boutique shops and cafés before you leave for your expedition to Antarctica. Embarkation will occur in the late afternoon, after which your vessel will sail down the historic Beagle Channel. This historic channel transects the Tierra del Fuego archipelago in the extreme south of South America. Expect an air of excitement as you depart—the next time you see land you’ll be in the world’s most southern continent! Prepare yourself for potentially rough water, but hope for a smooth sailing as the Drake is unpredictable and always changing. You’ll spend these first days getting to know your shipmates while your Expedition Team provides safety briefings and insights into what excitement lies ahead. 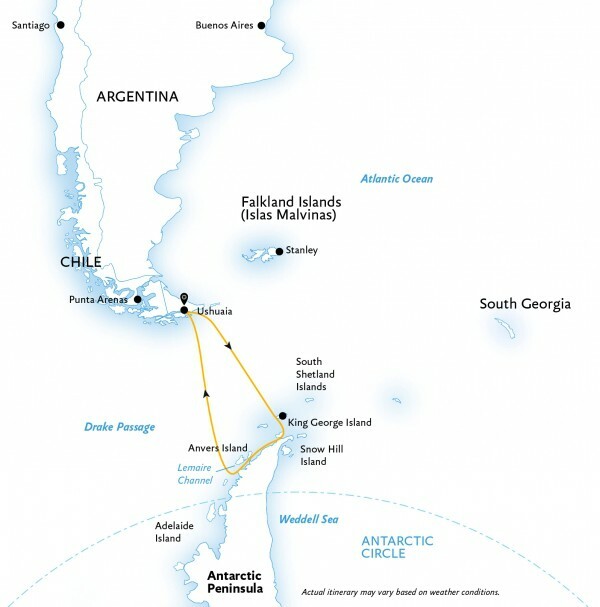 Once the Antarctic Convergence is left in our wake, you will truly begin your Antarctic adventure. It is perhaps the first sight of land itself that is embraced as the true beginning of any Antarctic expedition. You will begin to appreciate why this region has long captivated the attention of explorers and travelers alike. Every time we visit Antarctica, we witness something new or unexpected, which means that your expedition will be unlike any other—creating a unique, personal experience. Each day, you will take Zodiac excursions from the ship to explore local bays, channels and landing sites. With wildlife always at the forefront of our minds, you will visit penguin rookeries, scout for humpback and minke whales, and search for a number of southern seal species, including the cunning leopard seal. The majesty of the Antarctic Peninsula’s mountains will enchant as you scramble up snowy pathways to vantage points offering you 360° views of your surroundings. One of these in particular, in Danco Island, affords us the opportunity to visit a penguin colony high up on a ridge. Here, you’ll have the choice between hiking to the island’s summit or spending time sitting quietly on a pebbled beach, enjoying the antics of curious penguins. If you’re feeling extra adventurous, participating in the Polar Plunge swim is about as crazy as it gets! Amid the serene silence of Antarctica, noisy interludes become indelible memories, such as penguins squabbling over prized pebbles, or the boom and crack of a calving glacier in Neko Harbour. Each day will be different, having been carefully crafted by your Expedition Team to entertain and educate you about this wonderful part of the world. The personal space is exceptional. Every cabin has either a private walk-out or Juliet balcony for direct ocean views. World Explorer also delivers plenty of public areas to unwind in after a day outdoors, including the glass-domed Observation Lounge for quiet contemplation and full skyline views, the Explorer Lounge for a drink and a chat, and the library for more intimate relaxing and reading. Presentations and discussions are facilitated in a dedicated lecture theatre. Health and wellness facilities feature an outdoor running track, a small gym and a sauna, plus a spa with change rooms, showers and lockers. For the active adventurers, add-ons include kayaking, camping and stand-up paddleboarding. Blending high design with total functionality, World Explorer is all set to be your home away from home on the seas. • Experience abundant wildlife: penguins, seals, whales and more! You’re ready to explore King George Island and the Antarctic Peninsula—and no Drake Passage crossings are required! With a spectacular aerial view, included charter flights between Punta Arenas and Antarctica ......click here to read more. This voyage provides the opportunity to get a taste of everything the Arctic has to offer, from polar bears and walrus to spectacular scenery. You’ll be treated to daily presentations ......click here to read more.